Online knowledge base and discussion forum about violins and other musical instruments. What size violin should I use? 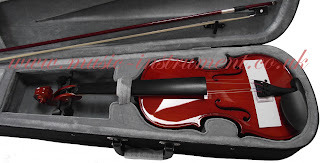 The violins that are from Music Instrument UK come with almost everything that is needed for playing, apart from that the strings are loose and the bridge is wrapped and placed underneath the tailpiece (shown in picture below). This is the standard packaging method to prevent the violin from being damaged during the delivery process. So, your new violin will need to be 'set up' before you can play. This instruction describes a basic procedure on how to set-up a violin. This is to help you make a start with your new violin, but please do not confuse this with the ‘professional set-up’ carried out by respected violin shops which often charge a set-up fee. There are three things that have to be checked, i.e., the bridge, the strings, and the soundpost. The soundpost is a small wooden rod that is wedged upright connecting the back and the front of the violin near the right-hand f-hole. It is important that you never attempt to play a violin without a properly fitted soundpost. Your instrument from music instrument uk has already got a soundpost fitted, so you just need to check this and once you are satisfied that the soundpost is in order, you can then turn to fixing the bridge. The bridge has come wrapped up and tucked underneath the tailpiece. You need to extricate this carefully by firstly unscrewing the adjusters as loosely as possible to minimise the risk of them crashing down onto the varnish when you take the bridge out from under them. This bridge was supplied with a basic outfit. The feet are shaped and there is some curvature. It is not too high and it is possible (with some effort) to tell which way round it goes (the E-string goes on the lower side). If a bridge is fitted properly its feet will have been shaped so that they follow the curvature of the violin body exactly. The bridge will be held in place securely by the pressure of the strings passing over the top of it alone. Never resort to using glue to keep the bridge in place. Setting the bridge up is not difficult. The lower side will accommodate the E-string and the feet should be aligned with the notches in the f-holes with the strings going into the grooves on the top of the bridge. If when you have done this, you see that the strings are not equally spaced you may have got a bridge where the grooves have been cut in the wrong place. Not a disaster. You may well find another suitable groove and can move the string over. If not, then the metal strings will probably make their own groove. Otherwise it is easy enough to make a notch with a nail file or some other implement. In order to set up the bridge it is likely that you will have to loosen the strings. Once you've got the bridge up, it’s time to adjust the strings. Starting from the bottom they are turned G-D-A-E, the G being below middle C and then they go up in fifths. If that causes you alarm, do not panic because the teacher will be used to doing a quick tuning job at the beginning of each lesson anyway. An “A” tuning fork, digital tuner, pitch pipe or a piano may be used to assist with tuning. Fine tuners or pegs may be used to tune the violin. Please note that violin strings are under tremendous pressure. Turning them too far can break the string or even damage the violin. Turn pegs very SLOWLY, and just a little at a time. You may only need to use the fine tuners on the tailpiece. Before tightening the strings with the pegs, make sure there is enough room left for the fine turners (adjusters) to be turned downwards in the fine tuning process. The ‘E’ string is the most delicate string which should be tuned last. Usually you will be able to use the fine tuner on the E string to make a slight adjustment so that the pitch matches a Perfect 5th above the A string. Remember that each time you tune the string of a violin you change the stress everywhere on the instrument. Once you get the E string in tune, go back and repeat the process starting with the A. If there has been a change it will only be a minor one, so bring the A back into tune. Then the D, then the G, and finally the E.
You might also consider investing in some “Peg Drops” so that you can prevent the wooden tuning pegs from slipping after tuning your violin up to pitch. This is the most common problem when first trying out a new violin. This is your chance to make life easier for the teacher by keeping the bow in a 'rosined' condition! Tighten the bow until you can bounce it on your arm but don’t tighten it until it appears straight. There should be a natural curve to the bow. When new the rosin block has a skin which has to be worn away by repeatedly stroking the bow across it several times (eg. 5-10 times or more). Alternatively, stroke the rosin block quickly back and forth 2-3 inches at a time on the bow. Make sure that both the tip and the frog ends of the bow are more heavily rosined than the middle. One last thing – shoulder rest. You may consider fitting a shoulder rest to your violin for good posture and comfort. Discuss this with the teacher if necessary. Music Instrument UK is specialised in supplying violins to individuals and music retailers in the UK and Europe. Violins are available in various sizes from 1/8, 1/4, 1/2, 3/4, to 4/4. All violins have been hand crafted with carefully selected quality maple woods by skilful violin makers. Each violin package comes as a complete outfit with brazilwood bow, bridge, rosin, chinrest and lightweight hard case, ready for set up and play. Music Instrument UK. Watermark theme. Powered by Blogger.